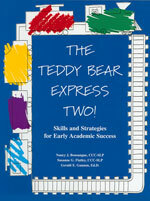 This companion book to the first Teddy Bear Express provides intervention strategies and materials for children three to five years of age consistent with their developmental readiness level. The program consists of units, each of which contains four supporting lessons in communication, academics, motor skills, and social relationships. It helps children with reading, writing, and mathematical thoughts. The units include friends, colors, shapes, words, nature, transportation, senses, community helpers, seasons, and much more. The activities are process-oriented and allow children to explore and create from their own imaginations. The experiences help children with the development of reading, writing, and mathematical thoughts. It includes assessment procedures to measure development within targeted areas. 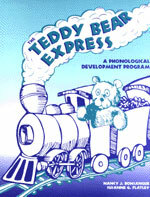 The Teddy Bear Express addresses the phonological development of young children. All the materials were developed with parental involvement in mind. Although parental involvement in weekly sessions with the speech/language pathologist is strongly encouraged, it is not essential, providing parents are given guidance and are committed to completing the home activities. Each lesson focuses on a particular phonological process. Lessons are written for a small group of children (approximately five or six) but can be adapted for use in a classroom setting. Lessons can also be adapted for sessions with individual children. Songs and stories are chosen based on familiarity and appeal to young children, as well as how effectively they reinforce a particular concept. Included in each lesson are suggestions for songs and stories. A word list is also included in each lesson for auditory stimulation. All the words on the word list contain the phoneme that was used to present the phonological process during that session. The program is particularly suited for young children in Head Start, regular education preschool, kindergarten, and first-grade classrooms to reinforce their communication skills. Gameboard formats allow children to practice math and have fun. Children locate "start," solve the problem, and write in answers that move them along the gameboard. Gameboards with themes of snakes, snails, spider webs, clowns, hats, trains, igloos, race tracks, and many other formats let students have all kinds of learning fun. Wow! Make math skills easy with highly motivating seasonal worksheets. You'll find turkeys, leaves, baseballs, pumpkins, ghosts, snowballs, valentines, eggs, flowers, kites, and many more. This book contains an assortment of multi-level arithmetic drill sheets that facilitate individualized instruction. The projects are highly practical and each exercise can be adapted to the student's learning needs and the arithmetic process desired. These activity sheets are a fun way for children to get practice in number recognition, reading number words, and basic addition and subtraction facts. Children work the problems and color spaces based on the color key. Colorful designs pop out. Using placement tests, practice pages, self-tests, and mastery tests, students can follow the sequential series of adding, subtracting, multiplying, and dividing fractions. Activities get progressively more difficult, with plenty of practice at each step. Specific skills involved are listed at the top of each worksheet. Blackline masters reproduce easily. The page design works well with older or higher grade level students, tooanyone who needs more practice in these fundamental math skills. This resource for teachers, speech clinicians, and others working in preschool programs is organized using the order of oral acquisition of phonemes. Each phoneme is introduced according to the way children learn to produce sounds orally. The primary focus is on consonant digraphs. For each sound, the child learns to orally produce the phoneme and listen for the sound in isolated words. Every phoneme is introduced with a sound association activity using the phoneme sound rather than letter names. This resource is loaded with dozens of activities so children will have fun with phonological awareness skills: Sammy Seal, Penny Pig, Billy Bird, and Zachary Zebra, to name just a few. Each activity includes suggestions for parents to use with children at home. 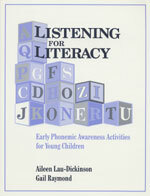 The expert authors who created Listening for Literacy bring years of experience and successful teaching to this book. They understand the close relationship between phonemic awareness and reading ability. Every preschool teacher, speech clinician, K-3 teacher, and tutor should own this resource.